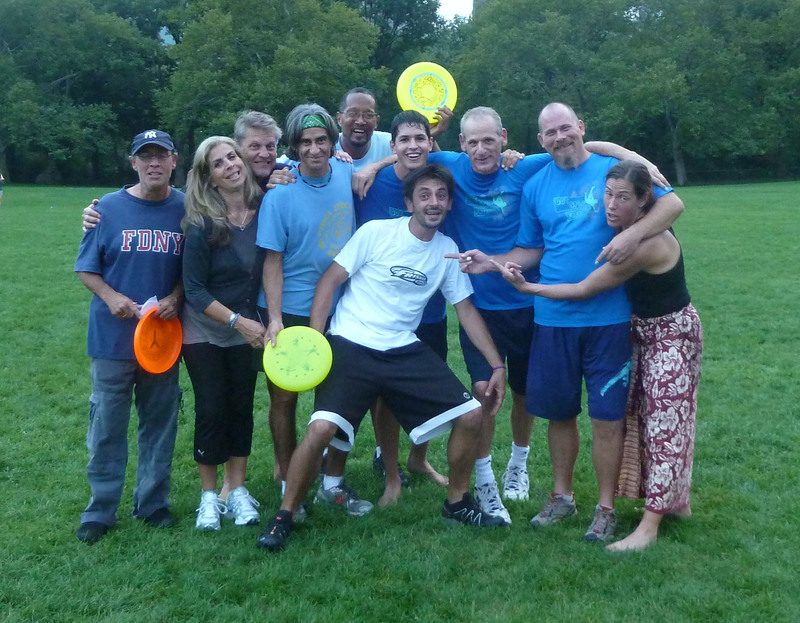 Oh My Goodness, what a wonderful weekend of Frisbee Fun and Frolic! There were so many people and Jams, it is hard to know where to begin. Please forgive the lapses of memory that will cause me to miss some memorable moments, but there was so much great stuff going on for five consecutive (if not necessarily straight) days that I just couldn’t store it all on the 141 functional neurons I have left. Matteo Gaddoni, the All*Star Thursday Guest Jammer Initiative invitee arrived on Wednesday, jet lagged but ready to hit our Green Beach. Sir Roger, Robbie-Rob ‘n Sue, JB, Young James, out-of-towner Heather Gray, and Chuck K. turned out for the warm up Jam. It was a nice and relatively quiet afternoon. You could see the incredible disc-dexterity that folks ascribed to the great Gaddoz was no joke. He pulled off many Hi-Dif moves with such ease that it usually took a minute to realize exactly what he had done. And this was after flying several thousand miles. Wow. Jam of the Day honors here go to Heather and Chuck, who went berserk in a SpeedFlow Jam. There were ambidiscerous back to back to back to back Gitis, plus an abundance Phlauds and Triple Fakes. Very Happy Frisbee! I strode in purposefully from the Southwest corner at about 5pm, anxiously peering over the rock to see signs of life, and right off the bat I could see multiple Jams. Young James shouted Your Late! We already have the Jam of the Day right here. We had a 5 Onus Scarecrow seals in a row in this Jam which also featured Fearless Lou, Toddy, B., and Young Daniel, every one of ’em sweatin’ and shreddin’. All that and I hadn’t even put down my bag yet. The turnout for the Great Gaddoz All*Star Thursday International Guest Jammer Initiative Festivities was incredible. It was the single largest gathering of the Tribe in all of the seven years of the All*Star Thursday tradition. 41 of our Plastic Peeps made the way to the Meadow. From far away lands our brethren and sistren traveled. Tokyo? Check! Italy? Check! Colorado, Florida, Bahston, and even New Jersey were all in da’ House. 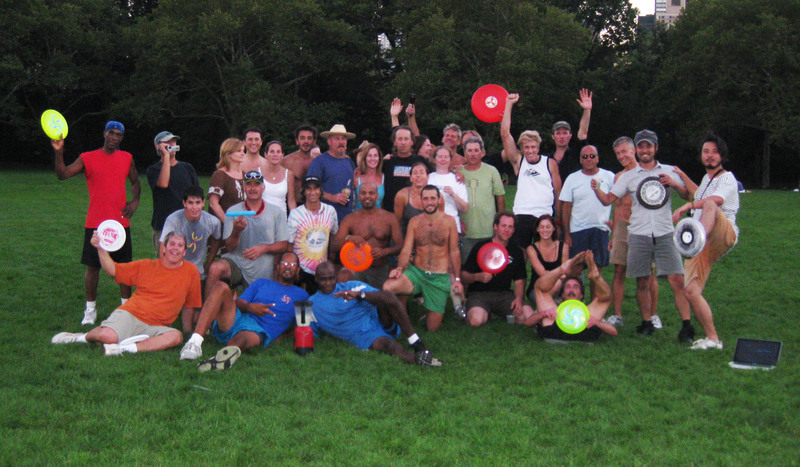 And our friends behind the Frisbee documentary The Invisible String, were on hand to document it all. Yes, it was a very good day. The attendees as written on the official disc-o-list include: The Great Gaddoz (TGG); Dan Burke; Alan C.; Toddy B.; Rick Williams; Bill Wright; The Roginator; Fast Eddie Bennett; Mark ‘The Estivator’ Sebastian; Ben-Heaver; Ralph-Heaver; Jaime-TJH; TedShred and The Lovely Chrissy; Robbie-Rob and Sue; Erwin Velasquez (with his baby girl); (Surprise Jammer) Arthur ShredNow Coddington; Claire Heaver; Marc But Regalbuti; Gerry Lynas; Sue Strait; Heather Heater Gravy Gray; The Oracle; Fearless Lou; Young Daniel; Young James; The Ageless Trevor Brown; Richie Regs (in from Florida); Chuck K. (who shot the tornado inspired Bandshell Jam); Quinn-O; Dave Marin; Pat Rabdau and Miracle Max; Marc Dana; Chris Ryan; Takashi (The Urban Street Jammer from Tokyo); Guitar Sean; Roger Flute; and last, but certainly not least, Bradford T. who came racing across the Meadow, tie blowin’ in the wind to get in on the big group shot. TP-TJH: Matteo, did any Jams stand out for you? TGG: (Laughing) All of them I am in Jam Heaven! And frankly, he was right. The weather was perfect, the people and players were all amped, and the joyful noise of spinning ˜bees (Hey Gary we missed you!) was everywhere. There was The Oracle and Bill Wright breaking out the original 1975 HDX 61 mold for a nice hour-long warm-up. The Flow these two got into was just amazing to behold, with Bill blasting through combinations and Joey stepping up his game to awe inspiring levels. And this was the warm-up. My first Jam featured Arthur, Toddy B., Young James, Alan C. which was just great. Sir ShredNow was intense from the start, ripping combinations that defy description even when they have names. Alan was smooth as silk, and Young James was just the happiest puppy you ever did see, Bad Attitude and all. When Takashi, our Urban Street Styler from Tokyo hopped in with the cameras rolling, we all knew the pressure was on. He seemed a little nervous at first, and the disc hit the ground for all of us as we pushed harder. But Freestyle Frisbee cannot be forced, it must Flow. And of course it didâ€¦quite nicely, I might add. Before detailing anything more, I have to share what Roger told me at Chez Meier during the official post A*T/Great Gaddoz Gathering. I was asking about notable Jams and he stated it plainly: Look, any Jam with Joey in it was Jam of the Day. The fact is He’s Joey, and you’re not. It may seem outrageous–and writing it week after week can be tough–but if you have seen Mr. Hudoklin in action of late, especially when there’s fresh blood around, you know that’s the Truth, Ruth. That’s why the Matteo/Joey solo Jam was so insane. If Gaddoz hit wild combo into a gorgeous gazelle-leap Gitis, The Oracle would answer with a crushing combination of moves to up the ante. Then Matteo would hit a flying Bad Attitude to turn it up a bit more, and The Oracle would match him. Once they started in with their courageous and quite crazy co-ops, my brain just fell out. And that was just one Jam. Alan/James/Matteo “ Alan and James got it started, with The Kid shredding and Mr. C. doing his thing. When Matteo jumped in Alan thought to himself Oh, this is gonna be good! Roger/Erwin “ The Reliable One and a Legend of Freestyle ”what’s not to like? Erwin finally making out to the Meadow on an All*Star Thursday was really great. Buti/Toddy/Matteo A no Noo Yawkuh Jam?! Oh Noooooooo! Lou/Dan B./Rick/Takashi “ My boy Fearless holdin’ it down with our esteemed guests, every one of ˜em rippin it up. Arthur/The Oracle/Forever Trevor/Young Daniel/Toddy B. “ This one was a real Shredfest. Young Daniel has a preternatural feel for the game that makes him really special. Sprinkle in the grace of the Ageless Trevor Brown as well as Toddy’s incredible repertoire and things start percolatin. Oh yeah, there’s Sir Arthur of Coddington and The Oracle too. S’Nice! Joey said there was a section of this one that went to 11 when he played the point and Arthur was his wingman, sealing play after play after play. Joey/Matteo/Bill W “ Bill said this was his last Jam of the day and it was rather insane. The Flow quotient in this one was very high, and ya gotta know that these three were magnificent. Joey/Paul/Matteo/Young James, then TedShred/Quinn-O/Greg Catch “ This one wound up morphing into my last Jam. Playing with Joey and Matteo? OMG! It was an honor to play with these guys. It was really remarkable on every level. The funniest moment came when Joey said I’m gonna go get me some Toddy and bolted. As we kept playing, there was a wee bit of a sense of abandonment for about 90 seconds. That’s when TedShred jumped in, starting with a Flamingosis for his first move. How’s that for a Super Sub? Later when we were at Roger’s talk about the day, Matteo told me about his thoughts at that same moment: Joey was gone? Oh no then Teddy came in and ”WOW! We both laughed at our good fortune. Quinn-O added his Southpaw delivery and ambiDISCterity to the mix, and then Greg Catch came in and we jammed until darkness settled in. Whatta Day! That’s enough for now…there’s one more day to cover.